Did you know that many pains and aches in the body are caused by issues in the feet? A proper scan can help a medical professional discover pressure points, why your arch may have been reduced, and a wealth of other useful information. Many patients are interested to learn that their feet are so responsible for their neck and back problems—but these are the supporting structures of the body and directly impact most other areas in the human anatomy. This is one of the primary reasons why we often suggest our patients enjoy the benefits of foot levelers or pelvic stabilizers. The first thing our team of medical experts will do is utilize a digital scanner to image your feet. 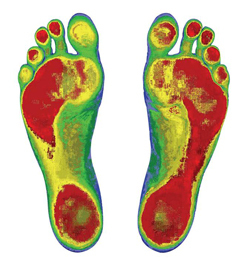 This is a simple process which simply intends to discover which areas of the feet are under the most stress or pressure, and can result in reports with up to 16 critical data points that are specifically tailored to your unique anatomy. Foot levelers are shoe inserts that will provide you with the support and comfort you need to improve your posture and provide the rest of your body with a reliable, stable system of support. Many patients report a significant improvement to their posture, but also—and perhaps more importantly—a dramatic reduction in pain of the knees, hips, neck, and back. These inserts are highly effective and very comfortable to wear on a daily basis.